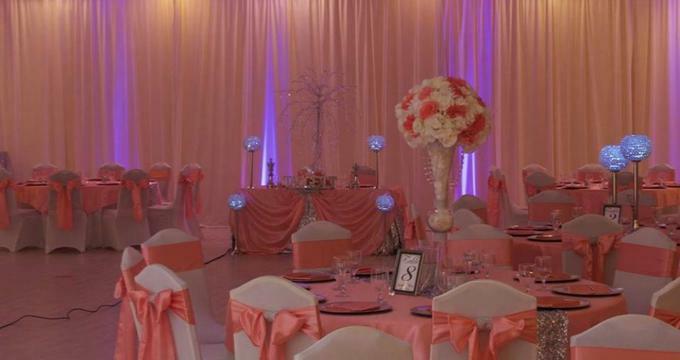 Tampa Events Banquet Hall is a spacious and elegant venue for weddings and other special celebrations. Combining ambiance and style to create a beautifully appointed and sophisticated site, Tampa Events Banquet Hall features a banquet hall that can be used as one large hall or divided into three different rooms, along with a variety of packages that cater for every budget and taste. Conveniently located near the I -275 exit for Fletcher Avenue in north Tampa, the 15,000 square foot facility boasts newly remodeled interiors with high ceilings and refined touches, gleaming hardwood floors, an elegant reception hall and on-site kitchen for catering, modern bathrooms, and energy efficient LED lighting to set the mood. Tampa Events features a banquet hall that can be used as one large hall for up to 500 guests, or divided into three different rooms each with a capacity of 125 to 150 guests, depending on the size of the event. Tampa Events offer a variety of packages as per requirements, which include the hall hire for four hours, set up before event and clean-up after the event, a fully decorated stage, which can be used to ceremonies, photo shoots or as a DJ area, lighting, and audiovisual equipment. Other amenities included in the packages include a full-service bar station with bartenders, full access to a fully equipped kitchen for catering and preparing food (warming up only), access to a large fridge, freezer and ice machine, tables, chairs, floor-length linen and napkins, centerpieces, and more. Additional services include venue set up and clean up, event planning and management services, lighting and sound equipment and management, and preferred vendor lists. Tampa Events Banquet Hall is located at 13507 N Nebraska Avenue and has on-site parking. A significant business center on Tampa Bay, Tampa offers a wealth of accommodations for all budgets, as well as plenty of entertainment, from casual and fine dining restaurants, buzzing coffee shops and cafés, and bustling bars and nightlife. Renowned for its excellent museums, art galleries, and other cultural offerings, the city has a variety of attractions to explore, including the African-themed Busch Gardens amusement park, the Tampa Museum of Art, and the Florida Museum of Photographic Arts. The historic Ybor City neighborhood has a vibrant dining and nightlife scene.